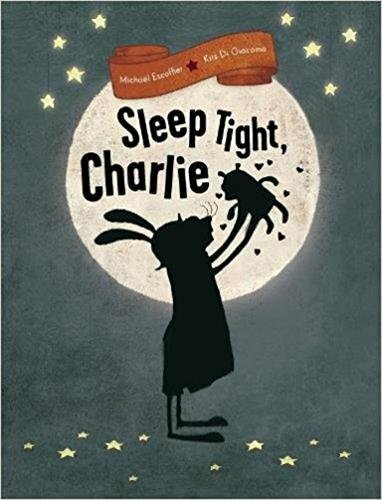 With a title like Sleep Tight, Charlie, one might be tempted to think they were about to read a goodnight bedtime story. Not so in this case, unless your little listener is not afraid of monsters under the bed just when they are getting tucked into it! From the dynamic and prolific storytelling duo Escoffier and Di Giacomo comes Charlie, who is winding down his day. After a full day of wild and crazy escapades, this roller-skating, ice cream-licking, kite-flying, horn-blowing, toy-toting bundle of energy is, in fact, getting ready for bed. With one wide eye glaring out at the reader, Charlie stands front and center, brushing his rabbit buck teeth surrounded by an odd assortment of vanity jars and vases. This odd assortment of props continues on to the bedroom where Charlie is going through the motions of his bedtime routine. He has a nightstand by his bed, where he rests a water glass. There is a tidy area rug where he sets his slippers. And there is the quirky collection of bric-a-brac—a broken tennis racket, a coffee press, a potted cactus plant, a wind-up alarm clock, and a simple wooden toy crate—stored haphazardly under the bed. Charlie is sure to check this particular area for monsters as part of his ritual. Charlie takes his teddy to bed and quickly falls asleep. No sooner have his eyes closed than he hears an obnoxiously rude tap-tap-tapping outside his window. He jumps to attention as a kitchen whisk, a rubber duckie, a teacup and saucer, and a pair of undies fly into a panic around him. Looking out the window the full moon alights on Bird hammering artwork onto the tree trunks. Wild mushrooms, watering can and garden gnome decorate the yard and participate in the subsequent scenes. Using his fishing rod, Charlie lowers an alarm clock next to Bird to show him what time it is: Bedtime, of course, so . . . stop making noise! Bird flies away and Charlie must repeat his bedtime routine all over again before he can go to sleep. Water glass rested, slippers settled, monster checked. Teddy bear hugged, eyes closed, asleep fallen. The scenario is repeated by a nut crunching squirrel and a squeaking mouse. Charlie is getting grumpier and sleepier. His bedtime ritual becoming more and more distorted. Slippers go in the water glass, teddy on the night table, rug gets snuggled. However, in his sleep-deprived state, Charlie forgets to check for monsters under the bed. Lo and behold, Charlie’s snoring wakes said monster who, in turn, is grumpy because he is also trying to sleep. Sleep Tight, Charlie rates high on design and story elements. The fonts are easy to read and well placed. Onomatopoeia pages encourage kids to participate in reading, while also emphasizing Charlie’s increasing irritation. Picture spreads are perfectly in synch with the action, energy, and progression of the story. The story too has a great balance of conflict build and character change to keep the pages turning. The pièce de résistance however, is bestowed upon the illustrations. The subdued color palette contrasts well with the high energy of various inventive perspectives and the strangeness and variety of Charlie’s house hold items. But the eyes tell all. Charlie’s get heavier and heavier. Teddy suffers from droopy baggy eyes as he fights to hang in there with Charlie. Bird, Squirrel, and Mouse even show a bit of remorse all from the disposition of their eyes. Speaking of eyes . . . those of young readers will be energized as well, opposite of Charlie’s bedtime example. Not so much ready to wind down for a time of rest but rather more inclined to be bright-eyed, ice cream-licking, kite-flying, horn-blowing, toy-toting bundles of energy. All symptoms of a very good book.